The PDF below may be viewed and printed using Adobe Acrobat Reader version 5 or higher. If you do not have Acrobat Reader or have an older version, you may download the most current Acrobat Reader. The fine arts department of the Minnesota State Fair presents an annual art exhibition that is the result of a juried competition. Participation is open to all living residents of Minnesota, and each may submit one work for consideration. Only those works selected by the jurors are displayed in the Fine Arts Center during the State Fair. In 2018, a total of 2,620 pieces were submitted, and 344 works were accepted. The fine arts rules and regulations are available under “General Information.” Please be sure to read the rules and regulations before beginning the registration process. REGISTRATION: Registration begins April 1, 2019. Registration is required for the Fine Arts Show and must be completed online no later than 4:30 p.m. on Monday, July 8, 2019, when registration absolutely closes. UNREGISTERED ENTRIES WILL NOT BE RECEIVED. JURY PROCESS: This is a two-phase jury process. In Phase 1, jurors will first review submitted digital images to determine which works will be delivered for Phase 2. Phase 2 will be an in-person jury review to determine the works to be accepted for this year’s Fine Arts Exhibition at the Minnesota State Fair. Please take care in photographing your work. The jury will consist of recognized individuals in their respective media. All artists will be notified via email of the decisions of the jurors. PHASE 1: Each entrant is required to submit at least one digital image of their work. Images should be in JPEG format. We recommend the shortest dimension of the submitted image be 1,000 pixels. Artists MUST submit AT LEAST ONE DIGITAL IMAGE of the entry. Only one image is required, but entrants are allowed up to THREE total images to present the ONE work. If images of more than one work are submitted, entrant will be disqualified. DIGITAL PROCESS: As digital technology continues to expand and influence the way many artists work, not simply photographers, acceptance of these entries is expanded to all classes. Note that this applies to the finished work itself, not the process of entering the submission. For instance, digitally photographing an oil painting for submission does not constitute ‘digital process.’ However, if an oil painting includes a digitally printed photo as a collage element, that constitutes an element of ‘digital process.’ During registration, for identification purposes and to insure we are best serving our participants, entrants will be asked to indicate if the submitted work includes digital process, and to describe that element. WEB PRESENCE: We recommend all artists establish a web presence. Participation in the Fine Arts Exhibition is an opportunity to make a lasting connection with viewers, many of whom might be interested in seeing more work. There are several options for creating a web page to display art and resume information, and many are free (e.g., mnartists.org). ELIGIBILITY: Original works by living residents of Minnesota executed since Jan. 1, 2017. Work of students eligible only if executed without the help of the instructor. Works that have been accepted and shown in a previous Minnesota State Fair Fine Arts Exhibition are ineligible. NOTE: Students in grades K-12 who are looking to enter artwork and photographs should do so in K-12 competition. Although the fine arts competition is open to any Minnesota artist, regardless of age, it is a highly competitive contest, and we strongly recommend students enter their projects in K-12 competition, where their work will be judged solely against their peers. 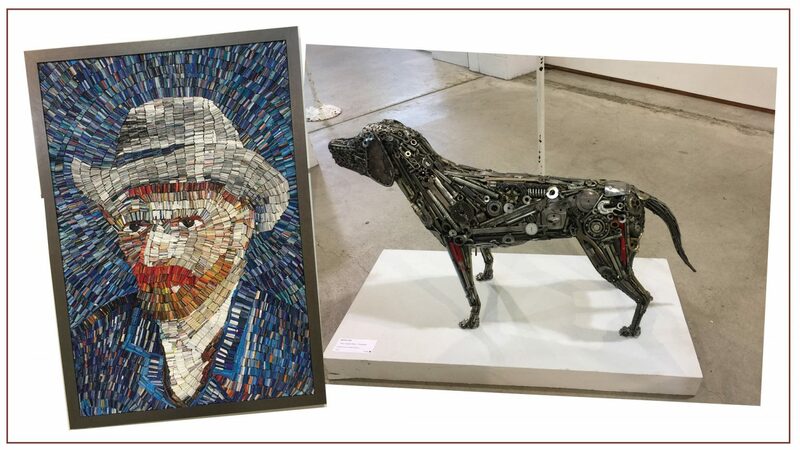 PLEASE NOTE: Any work accepted in the fine arts competition listed FOR SALE by the exhibitor will be sold as displayed through the Minnesota State Fair Foundation at a 20% commission. All accepted entries will remain on exhibit during the run of the State Fair even if sold. PHASE 1: From July 10-14, jurors will review submitted digital images to determine which works will be delivered for Phase 2. All artists will be notified via email of the decisions of the jurors July 15 & 16. PHASE 2: All Phase 2 artists will be notified via email of the decisions of the jurors July 31 & Aug. 1. Received Saturday and Sunday, July 27 & 28, 10 a.m. to 7 p.m.
Unaccepted work must be picked up Saturday or Sunday, Aug. 3 & 4 from 10 a.m. to 7 p.m. Accepted work must be picked up Tuesday or Wednesday, Sept. 3 & 4 from 10 a.m. to 7 p.m.
FIRST GLANCE EVENT: Tuesday, Aug. 20, 5-6:30 p.m. The Minnesota State Fair Foundation 501(c)(3) hosts the First Glance event to support the future of the arts at the Minnesota State Fair. Tickets are $40 per person, and you can purchase tickets at msffoundation.org or call 651-288-4323 by Aug. 13. All attendees must have a ticket. Light refreshments will be served. PREVIEW NIGHT: Tuesday, Aug. 20, 7-9:30 p.m. in the Fine Arts Center, for participating and non-participating artists and their friends.